Apex Homes for Sale | UPDATED every 15 minutes! With a consistent ranking in the top 10 for best places to live, it comes as no surprise to the residents of Apex that their city received the #1 ranking as Best place to live in the United States. The city is located in Wake County just south of Cary. The town of Apex received it's name from being the highest point on the Chatham Railroad route that stretched from Richmond, Virginia to Jacksonville, Florida. 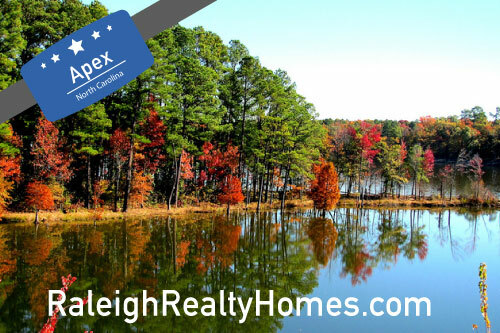 It is a great place to relocate because although it is a smaller town there is always something to do in Apex. From the fine dining, shopping downtown, or the parks and trails located in the area. As a part of Wake County, Apex is home to some really top notch public schools from elementary to high school. A lot of people relocate to Apex specifically because of how great the schools in the Raleigh area are.